NCapture files containing data collected from Facebook, Twitter and YouTube. The table below displays an example of a dataset containing survey responses. Each row represents a single survey respondent. The columns contain responses to closed-ended questions (demographics about the respondent) and open-ended questions (codable content). The table below displays a simplified example of a dataset containing Facebook data imported from an NCapture file. Each row represents a single post or comment. The structure and columns are automatically defined. Mike Jones I'm heading to a workshop on rainwater tank installation. Mary Smith You'll have to tell me about it afterwards. I've been thinking of installing one too. Adam Lee Water storage levels are at a thirty year low. When you auto code datasets containing social media data like this one, there are extra options, that make it easy to auto code the content based on the predetermined fields—for example, you could code this Facebook content by Username or Conversation. And, when you auto code by Username, cases are created and biographical information about the Facebook user is stored as attribute values on the case (you do not need to use the Classify Cases from Dataset Wizard for this). Can be used to sort and filter the records in your dataset. Surveys must contain a unique identifier that identifies the responses of each individual. A unique identifier could be the respondent's name, however, in a large survey, names may not be unique. For uniqueness and to protect the identity of your respondents, you may prefer to manually assign each respondent a unique ID number. You can then gather all responses of an individual respondent to a single node. The maximum amount of data that can be imported into a single dataset is 256 fields (columns) and 1,048,576 records (rows). Each record must be on a separate line. Remove any blank lines at the beginning or end of the file. Make sure that the file consistently uses tabs or commas to separate field values. The single or double quotation mark that encloses the field value is a text qualifier. Field values must be enclosed within text qualifiers when the field delimiter (comma or tab) appears within field values. For example, if comma is the field delimiter, and Dallas, Texas is a valid field value, you must enclose the value within qualifier, like this: "Dallas, Texas"
During the import operation, you can specify whether the file uses a text qualifier, and whether the qualifier is the single or double quotation mark. The Survey Import Wizard examines the data you are importing and helps you to ensure that the data is imported the way that you want. On the Import tab, in the Survey group, click either Excel or Text File. Click the Browse button, and then locate and select the file you want to import. Follow the instructions in the Survey Import Wizard. Understand the outcomes of the survey import. NVivo will import your data as a dataset, as well as create cases, nodes and attributes in your project. Specify how many rows are used for your column headers. If your data contains dates, select the format the dates are in. If your spreadsheet contains multiple worksheets, select the worksheet that contains the data you want to import. Select the file encoding that is used in the text file. NVivo tries to detect the file encoding used in the file—if the Data Preview area is blank or displays strange characters, try a different file encoding. Select the character that separates the values in your text file (tab or comma). Select the character (single or double quotation marks) that encloses text values in your text file. All text enclosed within text qualifiers is imported as one value, even if the text contains a delimiter character. For example, if the delimiter is a comma (,) and the text qualifier is a double quotation mark ("), "Dallas, Texas" is imported as one field value. If no text qualifier is selected, it is imported as two separate values. Check the Data Preview to make sure the settings are right for your data. Specify a location to store the cases resulting from the survey import. Select a question from your survey to uniquely identify your survey respondents, for example a name or ID. Specify a classification for the cases that will be created for your survey respondents. A preview of the first response in your survey is presented in a grid. On this screen you choose which fields contain open-ended values that you want to code (codable fields) and which fields contain closed-ended values that describe your respondents (classifying fields). Press the arrow buttons to preview responses from the first 25 respondents in the survey. Select the Closed Ended, Open Ended or Don't Import option to specify the questions you want to import and identify their data type. An open-ended question is generally a free response that you want to analyze for themes or ideas that arise. Close-ended questions are useful to describe respondents and ask questions of your open-ended questions. NOTE You can change the question name—for example, to make it shorter or more meaningful. Click on the question and edit it. Press ENTER or TAB to save your changes. NVivo Plus users can choose to automatically detect and code themes and sentiment in their open-ended survey responses. Click Close when the Wizard is finished. A dataset file is created. NOTE It can take some time to import and process surveys. This depends on the number of questions, the number of responses, and the amount of text in the responses. The larger your survey, the longer it will take to import. You cannot edit dataset content inside NVivo, so it is important to check and prepare your data before you bring it into NVivo. For example, you might want to check spelling or hide the identify of people or organizations mentioned in survey responses. You cannot change the analysis type and data type of fields (columns) after import, so you should consider how you want to use the fields, before importing the data. 3Table and Form View tabs—use these tabs to switch between Table View and Form View. You may have additional tabs if your dataset was created by importing NCapture files containing social media data. For example, you may have a Chart tab or a Cluster Analysis tab. Each row in a dataset has a unique record ID, based on the order in which it is imported. 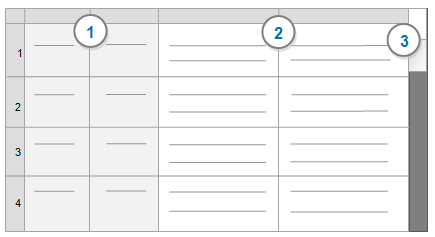 The ID is the first column in Table View, and the first field in Form View. If you sort the dataset by the values in the ID column, the dataset is displayed in the order that the records were imported into NVivo. You can navigate from record to record on Table or Form View by using the navigation buttons—you can move to the first, previous, next or last record. Hidden records are not counted—the Status bar indicates if any records are hidden (filtered) or if all records are visible (the dataset is unfiltered). The record number does not correspond to the ID value or any other field value. Use 'Go To' to quickly jump to a dataset record ID, see also link, or annotation If you try to jump to a record that is hidden, you will go to the next visible record. After importing a dataset, a node is created for each open-ended survey question—a useful starting point for further exploration. A case node is created for each respondent which gathers all of a respondent's answers together. Descriptive data is created for the cases using the closed-ended (classifying) information in the dataset—this allows you to compare respondent attitudes based on attributes like age or gender. Create charts to visualize the data—for example if you setup demographic data, you could create a chart to see how many cases are male and aged 50 to 59.